Online registration closed - TICKETS SOLD AT DOOR. Join the Lake Superior Community Partnership and Game Show Host, Rick Rhoades of WLUC TV6, for Marquette County’s version of Family Feud! The evening will consist of four local businesses battling for the Partnership Edition Family Feud Champion title. Appetizers will be provided by Outlanders and a cash bar. Interested in becoming a sponsor of this event? Check out the Sponsor Benefits Form. The participating teams have been established. Sponsors had first come/first serve option for a participating team (of five people). The first four teams to register were selected as game participants. The $250 team fee is waived for any level sponsorship. Thank you to our Trophy Sponsor : Quick Trophy! Vote for your FEUD FAVORITE and 50% of the funds raised from the voting competition will go to that team's chosen non-profit. 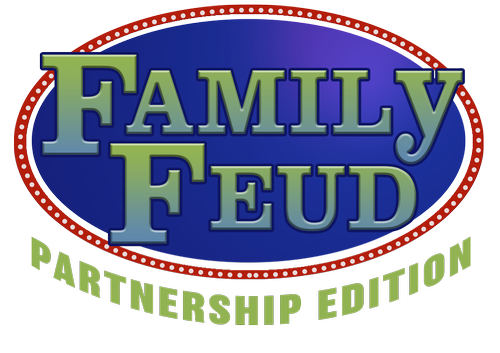 Find out which team is FEUD FAVORITE at the Family Feud - Partnership Edition event on November 1st. The winner of FEUD FAVORITE does not automatically win the game. Additional votes can be purchased with the +/- button on the right hand side of the registration page.